Celebrate legendary goalies from the Original Six, who fearlessly played with minimal equipment. 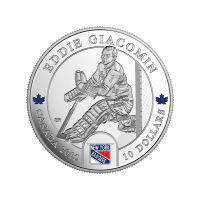 This coin series features Canadian-born goalies whose performances transformed them into hockey legends. The goalies who played hockey during the Original Six era were some of the toughest athletes to compete in any sport. They played with little protective gear, no face/head protection. Unlike today's players, they were poorly paid and had little support from the team if they were injured. Eddie Giacomin was the starting goalie for the New York Rangers for nine straight seasons. He lead the league is shutouts in 1967, 1968 and 1971 and shared the 1971 Vezina trophy. He was a classic stand-up goaltender with top stickhandling abilities, and had a lifetime 2.82 GAA. This coin is a wonderful gift for a hockey fan or collector of Canadian sportsmen who shaped our past. Don't get shutout, order yours today! This coin ships in a brown RCM branded clam shell fitted in a graphic box. ظهر العملة صورة لإيدي جياكومين يقوم بتصدي مع شعار الفريق الملون، وأوراق القيقب وعبارة "إدي جياكومين كندا 2015 10 دولار"
صورة لإيدي جياكومين يقوم بتصدي مع شعار الفريق الملون، وأوراق القيقب وعبارة "إدي جياكومين كندا 2015 10 دولار"